As much as I love the outdoors and exercise I am always careful on pushing this love onto my two youngest girls. The Cobbler (Scottish Gaelic: Beinn Artair) is a mountain of 884 metres (2,900 ft) height located near the head of Loch Long in Scotland. Although only a Corbett, it is “one of the most impressive summits in the Southern Highlands”,and is also the most important site for rock climbing in the Southern Highlands. Many maps include the name Ben Arthur(an anglicisation of the Gaelic), but the name The Cobbler is more widely used. The walk starts from near sea level and goes up steeply through a wood section and continues from there, following a burn known as the Allt a’ Bhalachain. this section is open with a beautiful vista ahead up towards the Cobbler. From here the path bypasses the Narnain Boulders, steepening at around 600 metres (2,000 ft). The path splits and you can go left and straight up the face between the two peaks but this was heavily iced and we had no crampons or sticks or even axes. We followed the path around and ascended from the rear. The back was still very snowy and it meant an ascent where we had to kick the steps into the snow. the youngest (9) was keen to be first but after 10min let me do the steps until we were 20feet from the top and then took the lead again. it was so unseasonaly hot with nary a breath of wind. So mild in fact we had lunch at the top. and then down to the pass again before the descent. And home to a fire ….. asked the girls the next day whether their legs were sore at all. The latest weapon in the war against bike thieves is the SpyBike GPS tracker – a device the size of a tube of Smarties that fits inside a bicycle’s steering column and can track its whereabouts anywhere in the world. The £83 SpyBike allows a cyclist to track the location of their bicycle anywhere in the world should it be stolen. The SpyLamp nestles beneath an innocuous-looking headset cap beneath which hides GPS technology, the workings from a pay-as-you-go mobile phone and a motion sensor to allow the bicycle owner to track the whereabouts of their bike via a website using Google Maps. 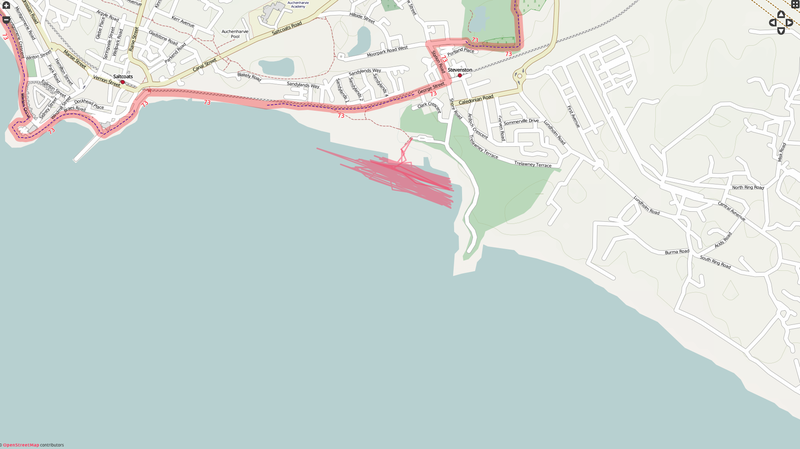 Once armed, any movement of the bicycle will prompt the tracker to send a text to its owner and begin to send details of its location, which can be tracked online. Car tracker systems that emit a VHFsignal, which can be picked up by receivers fitted to police cars have been available for years. The technology is proven, but expensive; the cost of buying the unit and having it installed can run to hundreds of pounds and there is also a subscription to pay. The Spybike is cheaper to buy and costs pennies to run. Using a typical pay-as-you-go SIM card, each position upload costs approximately GBP 0.0006p. 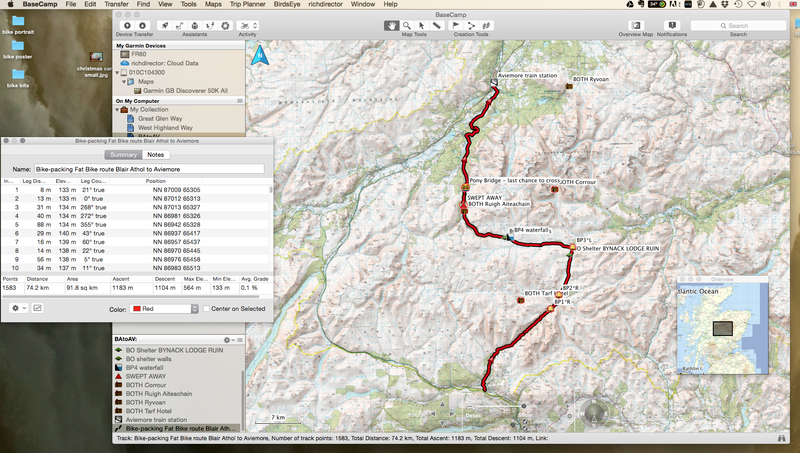 So starting using Basecamp as well – this has improved a ton since I last looked at it years ago – it helps having the etrex connected or the SD card plugged into the computer because then you can use the OS maps. If only basecamp let you use google or bing or satellite pictures as sometime you can see a trail that is not marked …..
Over the summer there was an interesting discussion in the comments section of this article about the accuracy of dedicated GPS units from companies like Garmin compared to the GPS data collected via smartphones. I’ve personally been biking with a GPS since 2001 (13 years!) and my take was that neither is any more or less accurate than the other. 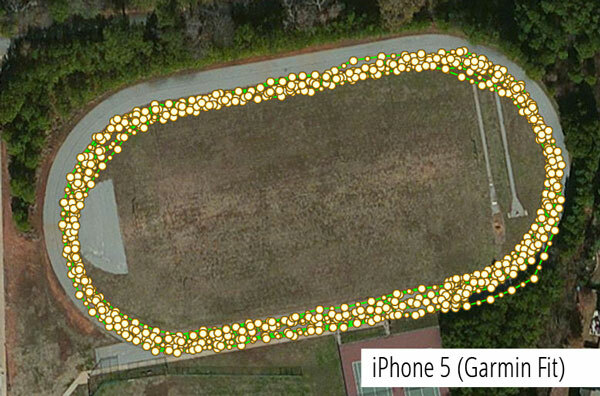 Still, I was curious: was there any difference in accuracy between various types of GPS devices? 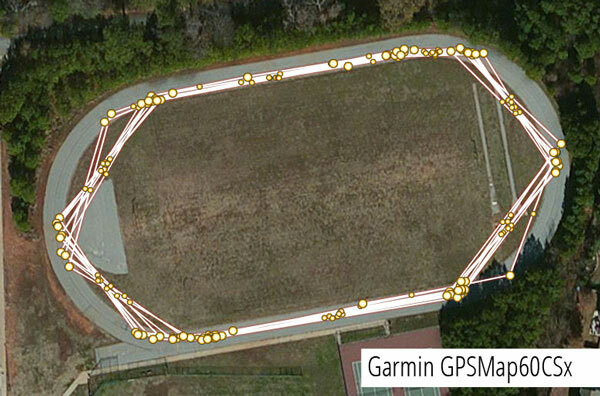 To find out, ckdake and I took 10 GPS devices–including 2 wristwatches, 2 bar-mounted units, 3 smartphones, 1 GPS-equipped helmet camera, 1 handheld device, and even a tablet–to a local quarter-mile track to see how each performed. We did our best to mount each unit according to its normal configuration; that is, wristwatches on a wrist, bar-mounted units on the bars, etc. All were rigged to a single rider (me!) and the test started and stopped at the same point on the track after riding 10 laps (2.5 miles). I stuck to the middle of lane 1 (thanks for the velodrome tip Chris!) and each GPS was started (but not moved) one at a time. We didn’t test timing on the devices since each unit is designed to sync time with the GPS satellites themselves, which meant we wouldn’t need to start and stop all devices at the same time. Here are the results, ordered by distance accuracy. Top 5: Asus Nexus Tablet (Strava), Nokia Lumia (GPS Logger), Garmin Fenix2, Magellan Cyclo505, and Garmin Forerunner 405. Bottom 5: Garmin GPSMap60CSx, iPhone 5 (Strava), Garmin Edge 500, iPhone 5 (Garmin Fit), and Garmin VIRB Elite. Interesting to note that the most accurate in terms of distance are not necessarily the most accurate at plotting route data. Keep this in mind when using GPS to map trails. Overall, the error rate is pretty low–around 3% or less for all but one device. Still, only 4 out of 10 were within 1% of the actual distance. On average (if we throw out the Garmin 60CSx) each device is off by about 1.4%, which is probably a good number to assume whenever analyzing your own data. Surprisingly, all but one of the devices over-reported the distance, which either means our track is slightly longer than we assumed or something else is going on. In my own experience I’ve noticed most GPS units report distance on the high side (for example, clocking 104 miles in a 100-mile race), and perhaps it’s by design to make consumers feel faster/stronger than they really are. Product engineers know the device isn’t completely accurate so why not just estimate everything on the high side to keep riders happy? 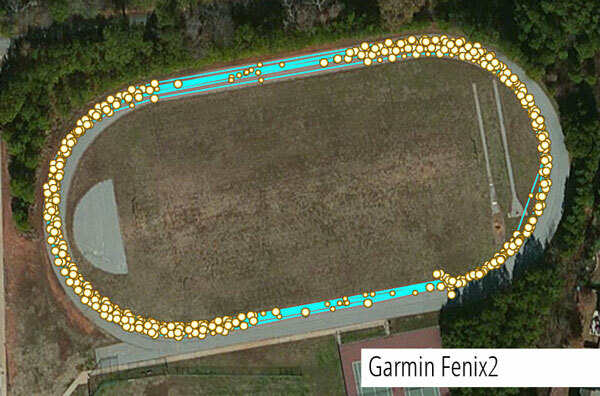 Another more serious possibility is that distance was added to each track during the time it took us to start and stop all the devices during our test (you can see this in the lower right corner on some of the plots above). Basically if you take pretty much any GPS, hit start, and set it on the ground, after a few minutes you’ll find that your GPS has logged several feet of distance without moving. How is this possible? GPS units never know exactly where you are located–they’re only accurate to within a few feet. So each time a GPS checks with the satellite, it’s calculating a slightly different position, even when you’re not moving. Perhaps one of the biggest misconceptions about GPS accuracy is that it’s all about the chipset (like the SiRFstarIII) in a particular device. While it’s true that some GPS chips are more powerful and/or sensitive than others, there are many, many factors that can affect distance calculations. But let’s stick with the idea that chipsets affect distance accuracy for a moment. Two of the top four GPS units in our distance accuracy test are regular old smartphones that determine location not just with GPS but also using wi-fi and cell tower signals to triangulate a position. And the Magellan Cyclo505–#4 above–is also wi-fi enabled, though we don’t know if it’s actually using wi-fi to improve location accuracy. 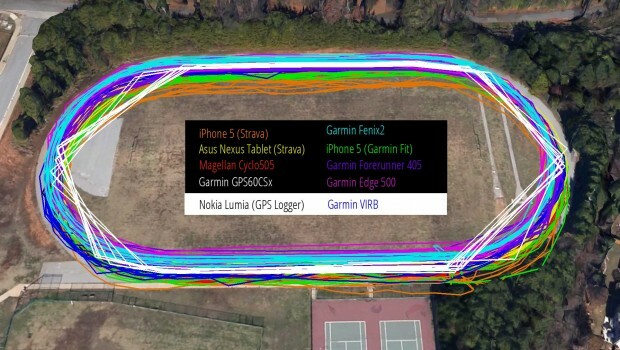 Still, having more sensors available to calculate location isn’t a guarantee of accuracy–the Garmin Fit app on an iPhone 5 ended up middle of the pack in our distance test, and the Nokia Lumia smartphone ranked 8 out of 10. So what the heck happened to the Garmin GPSMap60CSx–it was off by nearly 10%?! There’s another factor at play here, and it’s known as polling frequency. Basically, GPS units check in with the satellite on a regular basis to get the user’s position and save that information, along with the time, to record your ride. Many apps and GPS units allow you to set the frequency yourself. For example, if you record your position once per second, you’ll get better data than if you record only once per minute. The tradeoff is more frequent polling will drain your battery faster and fill up your memory quicker. In the case of our track test, the GPSMap60CSx was set to record much less frequently than the other units, resulting in “cut off” corners that significantly shortened the distance (remember, a straight line is always the shortest distance between two points). Fortunately this is an easy fix and has nothing to do with the accuracy of the unit itself. Some Garmin units (and perhaps units from other GPS manufacturers as well) have a “smart polling” option that doesn’t have a set polling frequency. Instead, the GPS records a point only if it’s not in a straight line with the point before it. A couple of the units we tested used this method which you can see below. In this test smart polling didn’t seem to affect accuracy but for a less-regular course (say, a twisting MTB trail) the GPS may have trouble keeping up with the rider’s constantly-changing vector. One final factor in our GPS distance accuracy test is the use of post-ride software processing. Basically if the GPS data is uploaded to a website (Strava, Garmin Connect, MapMyRide, etc. ), chances are that the data will be manipulated. This is particularly true for elevation data (which we’ll discuss in a follow-up post), but I suspect even distances are being tweaked behind the scenes for some of the devices we tested. In particular, it’s either incredibly lucky that the Strava iPhone app got within 0.1% of our target distance or that Strava is guessing (correctly) that our “workout” occurred on a quarter-mile track and is adjusting distances accordingly. Looking at the trace from the Strava iPhone app, it’s easily the messiest and least “tight” trace which, again, suggests it was either lucky or is making distance adjustments behind the scenes. The fact that the second-most accurate distance tracking also came from the Strava app but running on a low-powered Android tablet lends some credibility to the latter suggestion*. This is by no means a definitive GPS distance accuracy test. In fact, if we conduct this test again (which we probably will at some point), my hypothesis is the ranking will be completely different. And aside from the track test, a test in an area with zero cell phone or wi-fi signals over a known distance (not a quarter-mile track) could help isolate the additional sensor effect and the software manipulation issues. Bottom line: if you’re choosing a GPS device or app for clocking your rides, don’t focus too much on accuracy… they’re all pretty good, but none are bulletproof. 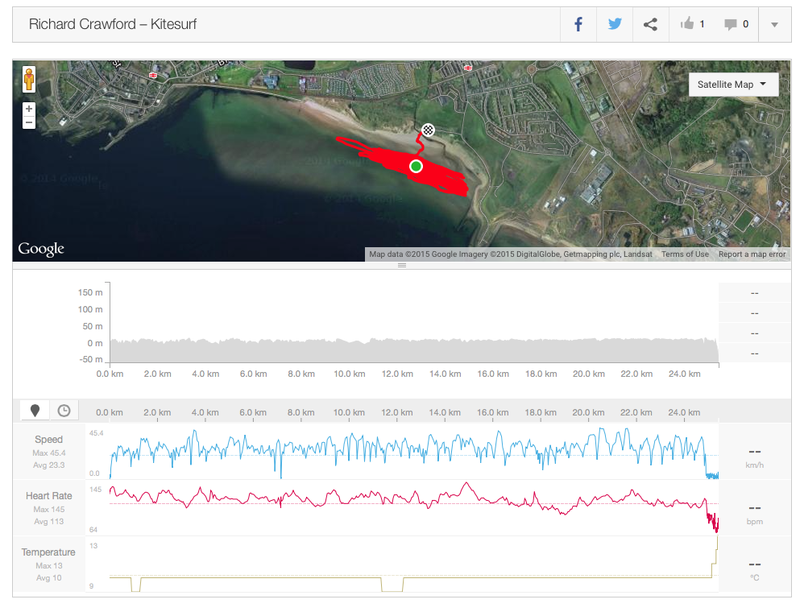 * Being curious, I tested the theory that Strava is recognizing track workouts–and modifying them–by uploading raw data from one of the other devices used during the test. The result: no change in the distance. Still not definitive, but that theory is looking shaky.